Are you an amateur or professional photographer? Do you have the skills to set up a photography business? If you have said yes to both those questions, then you may want to consider starting a professional photography website. You can upload and show off your portfolio on your professional website, which will allow potential clients to easily see the work you have done. And you can also even add your contact details and your rates on your business website too! Another advantage of having a professional photography website is that you can update people with news and announcements too. So as you can see, it is necessary that you have your website if you want to advertise your photography business and be successful at it. And the perfect service that you can use to host and create your photography website is, WordPress. WordPress is easy to use tool that lets you quickly set up a website. With WordPress, you will not have to go through all of the trouble when you create a website. You can just select a pre-made theme if you want to start with an attractive design for your photography website. You will not need to have a specialized knowledge of coding or web design. When you use WordPress creating a website can be as easy as choosing a website look that you like. And you can simply upload the relevant content onto your WordPress website and it will look great. Another advantage of using WordPress is that you can install and use plugins for your websites. These WordPress plugins can add a lot of functionality to your website. So if you need more features, you can simply use plugins for your photography website, as long as you use WordPress to create it. Before you start using WordPress to create a website you will need to prepare first. Start by collecting previous material that already has in stock. Or you also may want to assemble new material such as new shots for your photography. You will want to assemble a nice portfolio first before you create your website. You can display this new portfolio on your WordPress photography website, in order to attract customers and clients to hire your photography services. So if you want to get hired, you will have to make sure that you have a good portfolio first. And you will also have to prepare another way too. Try to come up with a business plan before you create your website. For example, ask yourself a few questions first, such as: Who are you working with? How much are you charging? You will need to ask questions such as these because you will need to come up with a concrete plan to structure your business and website around. You will also need to decide what kind of information you would like to include on your photography website. You will have to put information, such as contact details and your business name on your WordPress website. Once you have decided on a name for your photography business, and after you have decided what kind of information to include on your photography business website, you are ready to begin creating your website. You should use WordPress to do this, because it is easy to use, and can also deliver very attractive results. You should register for a new blog or website using WordPress, and then after that, you can choose to use a theme for your WordPress blog. You should choose a theme that lets you showcase the more of your attractive portfolio. The good idea is to select a theme that shows your whole portfolio at a single glance. There are many portfolio WordPress themes that will show off large images of your portfolio, so you will be able to show off your work the moment clients see visit your website. You will also have to use a theme that fits the design theme of your photography business. Luckily, selecting the right WordPress theme for your photography business website should not be too hard. There are hundreds of thousands of themes that you can use for your photography business website on WordPress. Next, you will also want to choose the right WordPress plugins to install. There are many WordPress plugins that can help your photography WordPress website immensely. There are WordPres plugins that can add more functionality to your website, which can make it easier to navigate for people who visit it. There are also WordPress plugins that can help drive more traffic to your website, which can increase the number of people is see your website. With these different plugins, you could greatly improve the experience of potential clients who will be viewing your WordPress photography website. When you use WordPress to create your photography website, you should know that WordPress can be used to create multiple kinds of web pages. WordPress can be used to create a blog, blog site, website, or any other kind of web page that you want. It is important to choose the right kind of website function for your photography business, or if you want you could also use a combination of different web pages for your WordPress photography website. It could be a great idea to add a blog to your WordPress website because you can showcase more of your skills through a blog. And the more blog followers you have, the higher chance that more people will share your blog and WordPress website with other potential clients. Remember, if you want the convenience of creating a photography website, you should use WordPress. With it, you will be able to set up an online portfolio right away. WordPress’ multi-functionality could also potentially attract new clients to your business. And to do this, you will have to use the right WordPress themes and plugins. 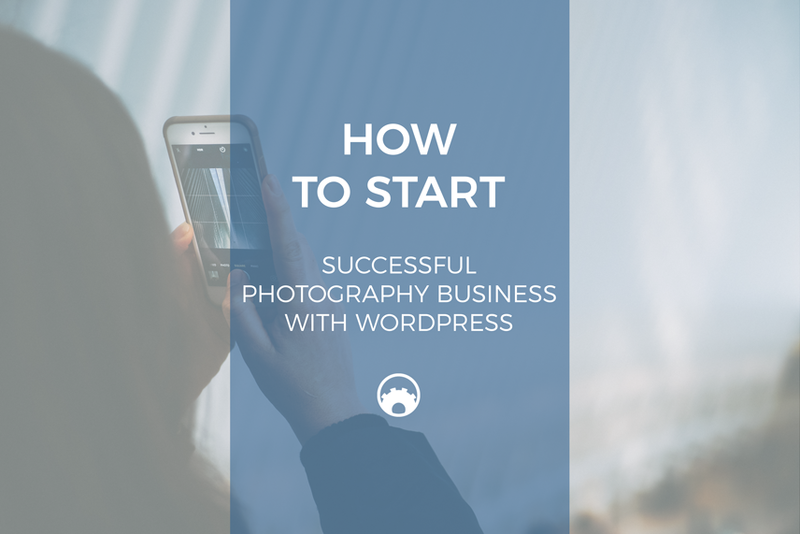 This is how you set up a blog or photography website using WordPress; it is that easy to come up with a great website using WordPress to fill your photography business needs.